We can produce wire formed parts and shapes in bright mild steel and stainless steel wire. 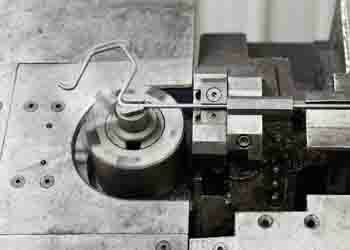 Our CNC wire forming machines can produce 3 dimensional parts. We have always been pleased to produce any shape a customer may require. Recent requests have included heart shapes for floral displays and a customers name in wire for a fairground buzzer game on their exhibition stand. Major production runs include work for the construction and retail industries where many thousands of wire forms are required. In bright mild steel we can manufacture using our extensive stocks of; 2.65mm, 3.00mm, 3.15mm, 4.00mm, 4.75mm, 6.00mm, 8.00mm and 10.00mm wire. We also stock 304 stainless in; 3.00mm, 3.15mm, 4.00mm, 4.75mm and 6.00mm. High volume or low volume (including prototyping), we are happy to provide the service you require. We can deliver anywhere. Call us or email for a quote, we expect to be really competitive on price and delivery.